MassLandlords staff and volunteers operate the best Massachusetts rental real estate networking and training events. Massachusetts is the most tightly regulated market for rental property management, owning rental property and multifamily investing in the United States (with California being a close second). If you want to own rental property here or are considering it, come see us first. The horror stories are real but entirely avoidable, and with a little training and networking you can succeed in multifamily investing. All events are open to the public. Membership is not required. Attorney Jessica Manganello presents at one of our rental real estate networking and training sessions in Cambridge. The topic was whether owners should be using Trusts, LLC’s, Inc’s, or nothing at all. Our networking and training events take place on a regular schedule, for instance, the nth weekday of every month. Typically there are few events in July and August, which MassLandlords staff use to improve operations for the next season and which owners and managers take off to work on our rental properties or take a vacation. Every event starts and ends with networking time and centers around at least one educational speaker or group activity. We meet at a variety of locations around Massachusetts. Our standards for venues are that they facilitate a large number of guests, offer a range of spaces conducive to both networking and training, and offer a level of quality and accessibility that makes the event worth attending. With rare exceptions for one-off events, we pay for our venue spaces ourselves out of ticket sales. 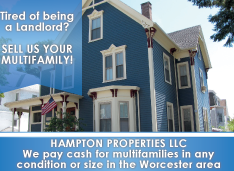 MassLandlords is a federation of rental housing associations around Massachusetts. Events can be either directly managed or run by volunteers. Directly managed events take place in or near Springfield, Worcester, Waltham, and Boston. These are operated by MassLandlords staff. Volunteer events take place in or near Pittsfield, Southbridge, Fitchburg, and Marlborough. These events are operated by landlords who donate their time or pay for limited local administrative staff. Our directly managed events are all accessible. Partner association events may or may not be accessible. Ask us before making plans. Direct managed events offer a hot buffet dinner that meets their nutritional goals, such that people can come to the event directly after work and not worry about staying for the entire event. Dietary restrictions are almost always accommodated with the purchase of an early-bird ticket and an email to hello@masslandlords.net. Regular attendees and premium members have standing orders on file with the catering company for their preferred location. Volunteer events have a wide variety of food options, some of which have additional cost. All of our real estate networking and training events are open to the public! Membership is not required. Pricing is typically set at or below cost for members. If you plan to attend ten events in a year, or if you want to receive any of our many online member benefits, you will find it cheaper to become a member. Become a member first. Public priced tickets are not partially refunded later. Additional events may be scheduled for different pricing. 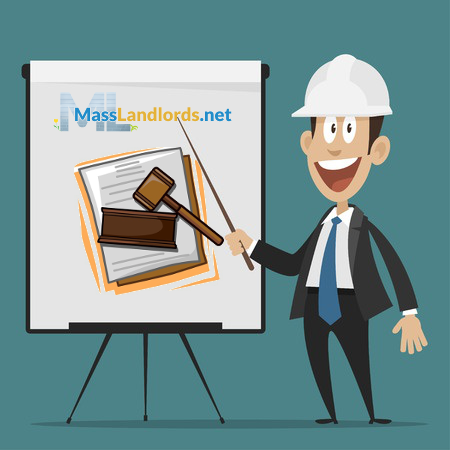 We conduct full-day training on Massachusetts rental real estate. See our crash course page for details. Don’t judge a book by its cover! The most successful owners and managers in the room are the ones who least need to impress with fancy clothing and bling. Use your judgment, but basically: come as you are. 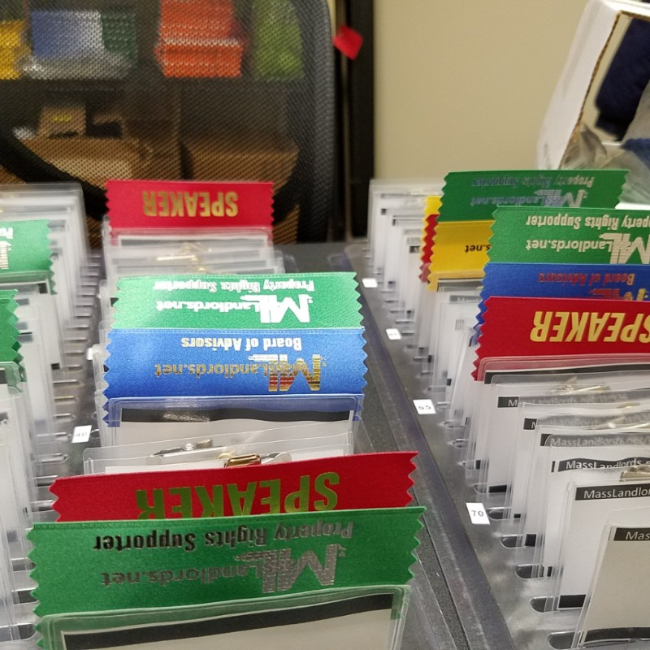 Purchase an early-bird ticket or a premium membership and we’ll professionally produce your nametag and bring it for you to the event. It takes a lot of special people to operate MassLandlords, including speakers (red tags), property rights supporters (green tags), and local and state board members (blue tags). You can be recognized at events for participation, or stay out of the limelight and just listen and learn. It’s up to you. 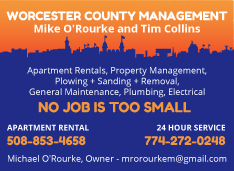 News and updates: Massachusetts rental real estate networking and training is an investment in your current and future business. Our members hear the news first. We knew that Worcester would be the new home of the Paw Sox before it was announced. We knew that Just Cause Eviction Rent Control had died in the legislature before the State House News Service. You can’t find this stuff online. 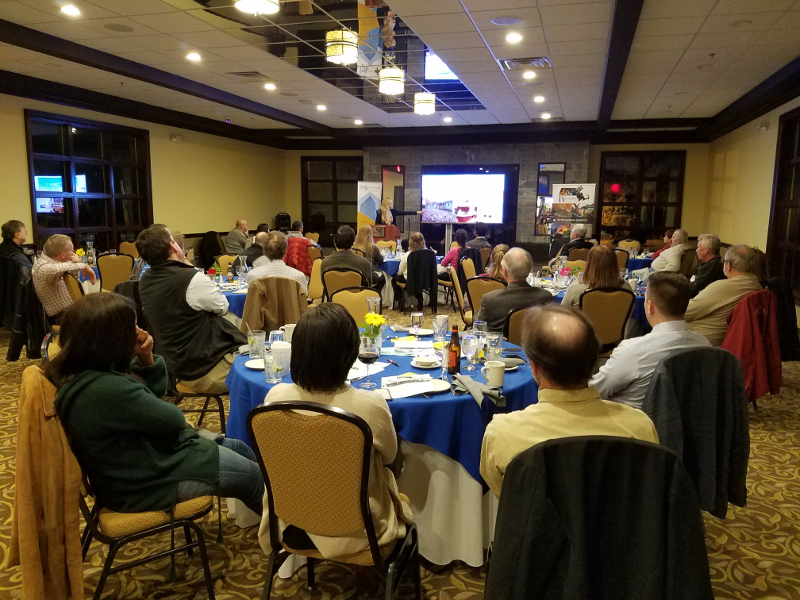 Strong Connections: Because we focus on buy-and-hold rental real estate, we cover a niche that other Massachusetts real estate networking and training events can’t touch. Our members learn about opportunities to buy in their regions before these buildings go on the MLS. In addition, the personal connections you will develop with other Massachusetts landlords will be invaluable. We don’t run anonymous event factories. Our attendees actually get to know one another, such that when you have an emergency you can pick up the phone and call someone you know for help and referrals. Local compliance: What you don’t know can hurt you. What you think you know because you read it online can hurt you even worse. There are particular ordinances in Massachusetts towns and cities and laws that don’t exist elsewhere, and that certainly will be missed if you operate with practices learned from other states. There’s even a dedicated Housing Court here. Did a tenant give your apartment to a squatter? Well they’re not a trespasser, they’re protected in Massachusetts as if they had signed the rental agreement. This is one example of dozens for why you should invest in Massachusetts rental real estate networking and training. We develop relationships with attorneys, police, fire departments, hard money lenders, judges, realtors, and many service providers to bring you the best money-saving tips, legal analysis, and business analytics. Owning rental property and multifamily investing in Massachusetts has never been easier thanks to our regular networking and training opportunities. Our Massachusetts rental real estate networking and training opportunities draw large regular crowds. We’re buy-and-hold investors not flippers and get rich quickers. We charge you to come because we don’t make undisclosed money. Each meeting centers around legitimate training designed to meet continuing education objectives. Get Rich Slowly: As buy-and-hold investors we focus on long-term value creation. This means we’ll cover things like water submetering and legal compliance. Yes, you can and members often do make deals at our events. You Pay Us so We Don’t Have to Sell You: All MassLandlords events have a “no sales pitch guarantee.” This means our speakers don’t pay us or sponsor us as a condition of presenting. We sell our real estate networking and training to real estate owners, managers, and investors. We don’t sell captive audiences to sharks. Note also that we don’t let well connected members or staff with side gigs restrict their competitors from attending or advertising. Vetted: Our presentations are selected by carefully vetting speakers in advance, often with long phone calls, and by reviewing their slides or giving them slides from our repertoire. 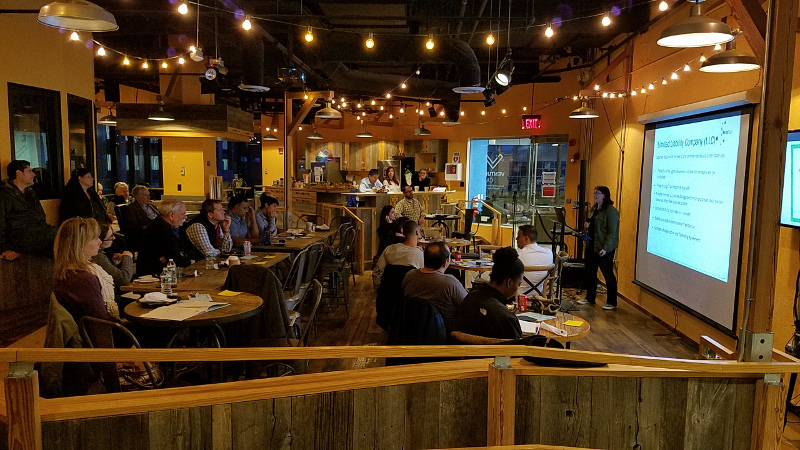 We want to make sure that you learn something relevant, and that if you attend enough of our Waltham real estate training and networking events you will become a more successful owner. Our attendees come back month after month year after year. Find a manager for your rental property. Find a buyer or a seller. Learn about rental property management, owning rental property, and multifamily investing. Network to meet new landlords, owners, and managers and let them know about your services. Come decide if rental real estate is the right full or part-time business for you. We respect your time! Speakers are vetted beforehand. We call them to make sure they’re prepared to hit our educational objectives in the time assigned. Night-of, we gently help them wrap up if they appear ready to go long. All speakers honor our “no sales pitch” guarantee. You can get year-long passes for Massachusetts rental real estate networking and training for specific locations. These are called “Premium” memberships. Since food and venue expense vary by location, you must choose your location. Premium memberships are available by following the links for Worcester, Springfield, Waltham, or Cambridge/Boston memberships on our join page. We’re always looking for new speakers. No, we use ticket pre-sales to select the size of the venue and to order food. Tickets may be transferred to another person for the same event. Let us know if you’ve transferred your ticket so we can inform the registration desk. With the exception of the Crash Course, you can wait until you know whether you’ll be attending and purchase a ticket at the door. I won’t be eating. Do I still have to pay? Yes, the venues count attendees and charge us by the head regardless of who’s eating or how much they ate. We also incur staff costs to set up and operate the event. Please let us know if you have any dietary restrictions. We can generally accommodate any request for early bird ticket purchasers (seven days in advance). We fully refund all event tickets if we cancel an event for any reason including weather. Typically we cancel if the forecast calls for 4″ of snow or more during the event, if the snow has stopped but cleanup is ongoing, or if there’s a named storm like a hurricane. We will issue an email, text message, and/or update the website. Refunds are issued same-day and will be visible on your statement in 5 to 10 business days. Can I give MassLandlords feedback on the event I attended? Yes, of course, this is how we know whether we’re doing a good job or if we need to improve. Our preference is that you fill out one of the yellow feedback cards circulated at events or tell the registration desk staff. You can also email hello@masslandlords.net. Can I bring my own marketing literature? Yes please, our attendees love handouts. You need not be a presenter or advertiser. Each directly managed event has a “leave-stuff, take-stuff” table. You can bring anything you want and leave it there. Please collect whatever is not taken at the end of the night. We generally don’t have enough room in our cases to carry your literature back to the local office. Leftovers may be thrown away at the end of the night. Can I use the event to get advice about a legal problem? Maybe. Many events have attorneys, mediators, or experienced landlords on hand. The only people authorized to give advice are attorneys and they may not be able to do that without a conflict check. You can certainly get legal information if not advice. If you have a specific issue, let us know after you purchase a ticket. We will try to arrange an e-introduction before the event so you can meet up. You may be able to arrange office hours with a local attorney to take place at our event. Note that if the speaker is a judge they cannot comment on a possible or ongoing case. Can I set up a table? Yes, advertisers can have a table at any directly managed event. Can I speak in front of the room? Every member can have the microphone for up to 60 seconds for our “member minute.” If you are not a member you need a member to introduce you and give you the mic (sit next to them). Member minutes start just before 7pm. I’m a member. Can I bring a friend? Friends can get in free with a “rack card” if they are not already on our list. Pick up a rack card at a directly managed event registration desk. If you bring a friend who attends under a public ticket, and they join that night, they will get their ticket credited toward membership. Also, you will get one month free extension of your membership, no limit. What Incentives are there to Try My First Event? If you purchase a public ticket, attend, and join before you leave the event, your public ticket will be fully credit to your membership. All are welcome: prospective or current owners and managers, service providers, public officials, and local non-profits all participate at our events. For owners and managers, we have brand new owners, people considering purchasing their first property, and industry experts. The average attendee owns or managers 26 units. Half our attendees own or manager fewer than 6 units. Every meeting has at least one person who is just thinking about getting started. So whether you’re big or small or in the planning stages, you’re welcome. Service providers of all kinds are welcome. 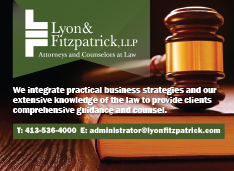 Attorneys find our events a great way to get new clients. We also have regular electricians, plumbers, exterminators, insurance agents, and more. Come have dinner, get to know your customers, and maybe pick up some pointers for your own rental property some day. Unlike BNI, we are non-exclusive; all are welcome! Town, city and state officials (all public officials) are welcome to campaign, network, and listen to the issues the housing industry is facing. Local nonprofits especially subsidy administrators can reinforce their connections to local owners and also gain valuable perspective. Nonprofits purchase premium memberships for their organization and rotate their staff through an event season so everyone gets a little exposure.